Check-In time for any property is 3:00pm on Saturdays. Check-Out time is NO LATER then 10:00am on departure day. Keys will be picked up at the NVR rental office and returned there unless otherwise instructed. You will receive a confirmation email 15 days prior to your arrival which will include directions to our office (or to the Property) and check-in information. All rentals are Saturday to Saturday, we may be flexible in the off-season, call or email us your requests. Reservations begin with a call or email to the office, all reservations will be confirmed by phone or email with on or agents. If a property is not available we will assist you in finding an alternative. Once a property is booked a Rental Agreement will be sent out and must be completed, signed and returned to us within 10 days of booking. This can be done through our on-line e-signature feature or by regular mail. If you need a copy mailed please let us know right away. Reservation Deposits are due at the time of booking: reservation deposit equals 50% of the rent. 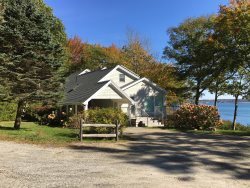 The balance of the weekly rental price, 9% Maine State tax, and a booking fee of 5% of the rental rate is required 45 days before your arrival. Any reservations made within 60 days of arrival require full payment at the time of booking. Reservation Confirmations will be EMAILED when payment of the balance due (rent, taxes, cleaning fees, pet fees, refundable Security/Damage deposit) has been received. We accept cash, personal checks, cashiers/bank checks, money orders and major credit cards (Visa, MasterCard and Discover). Reservations made within 60-days of arrival require payment in full by credit card or certified funds. If you want to cancel this agreement, you must notify us in writing. You remain financially responsible for your lease unless we are able to re-rent the property for your reserved time period to a replacement renter, which we will make every effort to do. If we are successful, we will refund what you have paid us, less a $100 Cancellation Fee. If we are unable to re-rent your reserved property, we will retain all funds collected from you, except your Security Deposit. Renters can look into purchasing Vacation Rental Travel insurance. Sheets & Towels are generally NOT PROVIDED. Linen rentals may be reserved in advance through the rental office. If Linens are provided at your cottage you will be expected to leave clean, folded linens for the next tenant. Pets are permitted at certain properties only. Leases which include a pet will have a $45 non-refundable pet fee added on. Please read our pet policies so that you understand your responsibilities. Each home has a strict occupancy limit and we honor those limits. These homes have private wells and septic systems and therefore have limits on what they can handle. Each individual counts as one person, regardless of age. If there are going to be any additional adults or children you will need to contact the NVR office for approval. We DO NOT allow wedding, reunions or large gatherings to be held on the property. Please keep in mind that some homes are located along waterfronts that may not be suitable for children. All of our rental properties are smoke-free, it is not allowed inside or outside of the property. If evidence of smoking is found there could be additional cleaning charges and a deduction to your security deposit. Fireworks are not permitted at any property. Many of our homes have additional services such as cable/satellite, internet, we cannot guarantee the services are always working. There are some issues beyond our control but we will do all we can do resolve that. We will not refund any money for interruptions.